In a real life adventure straight out of Willy Wonka, COR recently facilitated a visit to Karma Candy Inc., located in Hamilton for a group of Yeshiva Mishkan Hatorah students and their teachers. Rabbi Chesky Landau, Administrator at Mishkan Hatorah, approached the COR – Kashruth Council of Canada, with an idea to have a fun yet educational trip for their students and after some careful deliberation, COR staff decided to ask Karma Candy. The management at Karma, one of North America’s largest contract manufacturers of branded and private label seasonal and everyday confectionary products, graciously accepted our request and proceeded to plan a tour for the boys. The manufacturing facility has been in operation for over 46 years and was, in the last five years, sold to new owners who decided to contact COR and make their facility kosher. Since then, annual sales have quadrupled! Going kosher was apparently a very sweet business decision. The trip was planned as an incentive for the teenaged boys who had to commit to increased study hours in order to qualify for the trip. This further raised their level of excitement and anticipation for the planned tour. In the end, a second group from Yeshiva Reishis Chochma along with Rabbi Elkine joined the Mishkan Hatorah boys making the group close to 40 participants. Upon arrival, the boys were greeted by Karma staff that began by providing the boys and their supervisors a brief history of the company. Rabbi Eisenstein, the current COR rabbinic inspector at the plant was also invited to give the group further insight on what it means to operate a kosher facility. 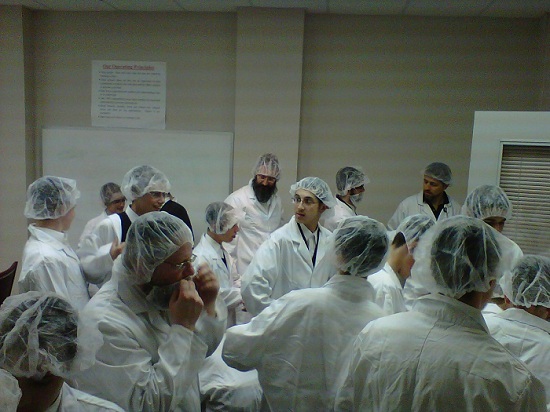 Then they were divided into three groups for a plant tour, properly dressed of course in white lab coats, hair nets and ear plugs. Fortunately for the boys, the day’s run was candy canes, lollypops and foil wrapped chocolate balls. They were fascinated to see how all the raw materials were pumped into the huge mixers where colours and chemicals were added to provide flavourings. From there the items moved to large machines that kept the candy warm while another machine thinned out the candy, then cut it to size. Yet another machine shaped and wrapped the candy canes or punched out the lollipops and inserted a stick. The final machine (a robot) inspected each item and inserted them into a box, wrapped the box and sent it down to the packagers. And these boys probably thought their Talmud homework was difficult! Karma’s talented employees involved in the tour were happy to show the group around, and at the tour’s completion, presented each participant with a bag full of candy (COR certified naturally).